Have you ever gone rafting or boating for the day or overnight and everything, I mean everything, gets soaking wet? Even your expensive camera and that cell phone that would not have worked anyway in the wilds, gets soaked and shorts out! Some river water is very cold and there is nothing better than getting out of your wet clothing into some nice dry sweats, pants and shirts. If it gets wet, the only thing you can do is build a fire, but, oh, the matches got wet too and you lost your lighter when you got dumped in the water. Wow could conditions get any worse out in the wilderness far from a warm camp site with the sun setting and the night getting cold! That’s where dry bags for rafting come in handy. One of the basics of rafting is to have something you can stow your clothes and camping gear, where they are going to stay dry, just in case you flip over in the rapids or there is a heavy down poor. Dry bags come in all sizes and shapes. There is something for campers, for hikers and of course white water rafting enthusiasts. You may want to select a bag that you can use for multiple purposes to save some money. Take your time and chose the right water proof bag for your sporting needs. There are small dry bags that you can place things like matches, cameras, cell phones and other small items that you do not want to get wet. There are large dry bags that you can use for tents, your food and even stow your clothes in for long camping trips. Once you have a dry bag, you will wonder why you never had one before! 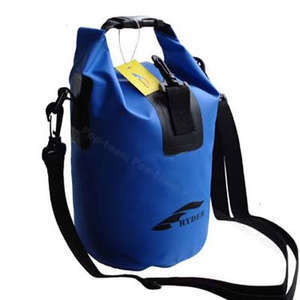 Even if you are going on an organized white water rafting trip were the rafting company transports all your stuff to the next place you are going to camp or meet your car, they cannot always guarantee that it will not rain or your stuff will not get wet. Placing your camping gear and clothes in a dry bag, makes it easier on the rafting company as well as yourself! There are situations were a soft dry bag will not do the trick for you. Although they will keep your things dry they may not protect them from being bounced around or from getting crushed. A dry case is the answer. These cases are water proof and shock proof and will withstand a great deal of bouncing and physical shock while protecting your things inside. You might have a first aid kit that needs to come along, but you do not want everything to be a jumbled mess when you need it in an emergency. Cases are also good for protecting electronics, providing that the interior is properly padded and that your camera is packed tightly and snugly so that it does not bounce around inside and hit other items in the case. Dry cases are also great for travellers, who are going by plane. I once saw a load of suitcases sit in the rain for over an hour. You can imagine how everyone’s clothes were soaked! This was on the way to a vacation destination too! We are going to have more posts about gear that many people will find useful for camping and rafting, so check back often. Feel free to leave comments about any gear that you find useful as well. Spam comments will automatically be deleted. Awesome article about dry rafting bags! Your writing is so refreshing compared to most other writers. Thank you for writing when you do, I’ll be sure to bookmark your site! The Olympic Training Center is in Colorado Springs. They train here because it is at a high attulide. Pike’s Peak is outside of the city. Outside of Denver is Mount Evans. They are 2 of the tallest in Colorado I believe. I know you can drive up Mount Evans, but check ahead of time for winter conditions that might close the roads. Estes Park is outside of Boulder and there is Rocky Mountain National Park. If I were you I would go skiing for a few days at Loveland Ski Area. It’s off I-70 about 45 min. west of Denver. Have fun!